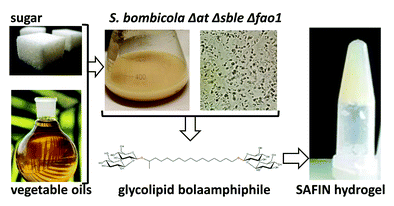 Recently, our lab succeeded to produce bio-based glycolipid bolaamphiphile on a gram scale by using the genetically-engineered S. bombicola strain Δat Δsble Δfao1 (Van Renterghem et al., Biotechnol. Bioeng., 2018, 115, 1195–1206). This article show that the bio-based glyco-bolaamphiphile readily forms a hydrogel in water at room temperature, and that the hydrogel formation depends on the formation of self-assembled fibers. Here, you can find more information on the Self-Assembled Fibrillar Network (SAFiN) hydrogel formed by the glyco-bolaampiphile.